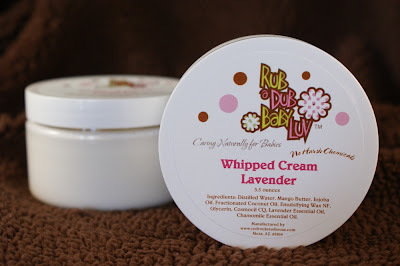 I received some samples from Red Rock Studios of their Rub a Dub Baby Luv products. I got a Booty Balm, Baby Bubbles Bath Wash, a bottle of Sweet Orange Lotion and a jar of the Whipped Cream in Lavender. The Booty Balm is $18, Baby Bubbles Bath Wash is $15, Sweet Orange Lotion is $14 and the Whipped Cream in Lavender is $13. All reasonable prices. But there is a sale on for 30% off. Now that’s a deal!! These products were created by a mother/daughter team. They are all natural and free from harsh chemicals that are not good for babies delicate skin. (or anyone’s skin for that matter) They are made to protect and heal. Each product is manufactured following GMP standards and tested by the FDA guidelines. 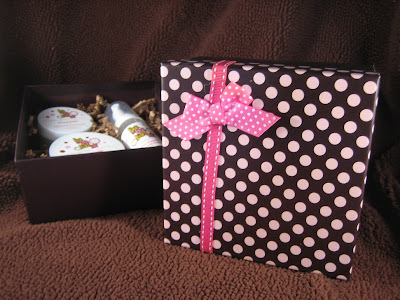 When I opened the box I was impressed by the cheery polka dots on each bottle. I poured some Baby Bubbles Bath Wash in the tub for Sadie and a nice light lavender scent filled the air. It is a shampoo as well as a body wash. However, when I put some in her hair, I had to use quite a bit since Sadie has a head full of thick hair. I would be more apt to use it as a body wash only for her. (not every 2 year old has thick hair like her either) As a body wash it was perfect. We then tried out the lotion after her bath. The smell was nice and light and just right for a child. Not too strong and not to light…enough to make them smell yummy and an excuse to give some extra kisses. Overall these products will be on my list of things to get. I always look for products without all that nasty stuff and these make the list for sure. You can visit their online boutique at www.redrockstudiousa.com Don’t forget to check out their 30% off sale which runs until December 31, 2009.